The 2010 Commonwealth Games (officially known as the XIX Commonwealth Games), was a multi-sport event held in Delhi, India from 3 to 14 October 2010. It was the first time that India hosted the Commonwealth Games and the second time it was held in Asia after Kuala Lumpur, Malaysia in 1998. A total of 6,081 athletes from 71 Commonwealth Games Associations (CGAs) participated in this Games, competing in 272 events in 21 sports. Athletes from 36 participating CGAs won at least one medal; athletes from 23 of these CGAs secured at least one gold. Australia led the medal table for the sixth consecutive time with 74 golds and 177 medals overall. Host nation India finished second in the table for the very first time in Commonwealth Games history with a tally of 38 golds and 101 medals overall. Botswana, the Cayman Islands and Samoa won their first ever Commonwealth Games gold medals. Australian swimmer Alicia Coutts emerged as the most successful athlete with five gold medals. The ranking in this table is consistent with International Olympic Committee convention in its published medal tables. By default, the table is ordered by the number of gold medals the athletes from a nation have won (in this context, a "nation" is an entity represented by an NOC). The number of silver medals is taken into consideration next and then the number of bronze medals. If nations are still tied, equal ranking is given and they are listed alphabetically by IOC country code. In Boxing two bronze medals were awarded in each weight class. Additionally there was a tie of three athletes for the third place in the women's pole vault in athletics meant that three bronze medals were awarded. Therefore, the total number of bronze medals is greater than the total number of gold or silver medals. Sally Pearson, an Australian hurdles specialist, was the initial winner of the gold medal in the women's 100 metres contest. However, the English Commonwealth Association launched an appeal arguing that Pearson had also false started at the same time that Laura Turner was disqualified for doing so. A final decision could not be made before the final as the chief start judge had left the stadium and the starter has no authority to disqualify an athlete. Pearson was disqualified later that night but a delay in communication meant Pearson was only told of the decision against her immediately prior to the medal ceremony. Nigeria's Oludamola Osayomi was promoted to the gold medal, while Natasha Mayers of Saint Vincent and the Grenadines and English athlete Katherine Endacott were elevated to the silver and bronze positions, respectively. On 11 October Oludamola Osayomi was reported to have tested positive for the banned stimulant Methylhexaneamine. She was disqualified from the gold medal position on 12 October and as a result Natasha Mayers and Katherine Endacott was promoted to the gold and silver positions respectively while Bertille Delphine Atangana of Cameroon was promoted to the bronze position. On 15 October it was announced that silver medallist Folashade Abugan had been disqualified after testing positive for testosterone prohormone. Aliann Pompey of Guyana was promoted to the silver medal position, with the bronze medal going to Christine Amertil of the Bahamas. Following the positive doping test recorded by Folashade Abugan Nigeria were disqualified from second place. England were promoted to the silver medal position, with the bronze medal going to Canada. On 8 May 2011 Sri Lanka's Manju Wanniarachchi was provisionally disqualified by the Commonwealth Games Federation after testing positive for Norandrosterone during the Games. He had 21 days to appeal the decision but on 26 May announced that he did not wish to file an appeal and retired from the sport. On 6 June 2011 the Commonwealth Games Federation announced Sean McGoldrick of Wales as the new gold medallist. Tirafalo Seoko of Botswana was upgraded from bronze to silver on the basis that he had lost to Wanniarachchi in the semi-finals. Nicholas Okoth of Kenya joins Louis Julie from Mauritius as a bronze medal winner..
^ Thorpe, Edgar (2010). The Pearson Current Events Digest 2010. Delhi: Pearson Education (India). p. 112. ISBN 81-317-3292-4. ^ "Introduction – 2010 Commonwealth Games" (PDF). Ministry of Youth Affairs and Sports (India). yas.nic.in. Archived from the original (pdf) on 6 July 2011. Retrieved 18 June 2011. ^ Mulvey, Paul (14 October 2010). "Australia tops medal table again". The Whitsunday Times. Archived from the original on 26 July 2011. Retrieved 18 June 2011. ^ "Awakening of a giant- from one to 101 medals for India in 76 years". 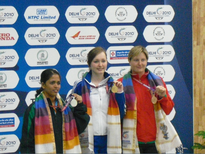 cwgdelhi2010.org (Official website of the Games). Delhi. 15 October 2010. Archived from the original on 25 July 2011. Retrieved 18 June 2011. ^ "Montsho wins Botswana's first ever gold medal". NDTV. 8 October 2010. Retrieved 18 June 2011. ^ "Fifth gold for Coutts as Australian medal rush continues". CNN. 9 October 2010. Retrieved 3 March 2011. ^ "Pole vault tie boosts Canada's medal count on Day 9". CBC News. 12 October 2010. Retrieved 8 April 2011. ^ "Official Medal table". Archived from the original on 6 October 2010. Retrieved 7 October 2010. ^ "Australian stripped of silver medal for rude gesture". The Sydney Morning Herald. 6 October 2010. Archived from the original on 10 October 2010. Retrieved 7 October 2010. ^ 'Communication blunder' sees Pearson stripped of gold. BBC Sport (2010-08-04). Retrieved on 9 October 2010. ^ (UKPA) – 1 day ago (7 October 2010). "The Press Association: Nigerian sprinters disqualified". Google. Retrieved 14 October 2010. ^ a b "Commonwealth Games 2010: Third Nigerian tests positive". BBC Sport. 15 October 2010. Retrieved 7 April 2011. ^ "DELHI 2010: Welsh boxer McGoldrick set to finally get his gold". morethanthegames.co.uk. 6 June 2011. Archived from the original on 8 June 2011. Retrieved 6 June 2011.